Assassin Gina Carano doesn’t have time for love. In fact, the last thing she wants is a mate. But Gina can’t stop thinking about Malek, the handsome AKM enforcer she met in Chicago. And now she’s beginning to fear Malek’s memory is the reason for her crippling panic attacks, which have assaulted her relentlessly since she left him. Malek has never dealt with the centuries-old death of his first mate, but now that he’s formed a new mating link to Gina, he has no choice. Stuck between the agony of mourning and the despair of being without Gina, his mind fractures as he attempts to reconcile the two halves of himself. 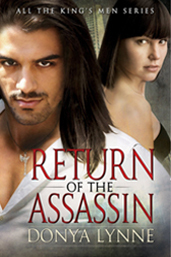 When Gina botches a hit on two vicious vampires in Miami, she reluctantly flees back to Chicago, where Malek must choose between the past and the future before he loses Gina forever. Warning: This book contains explicit sexual content, sensitive subject matter, references to non-traditional/alternative lifestyles, and profanity. Posted October 28, 2018 & filed under Uncategorized. Posted August 13, 2018 & filed under Uncategorized. Posted December 31, 2017 & filed under Uncategorized.